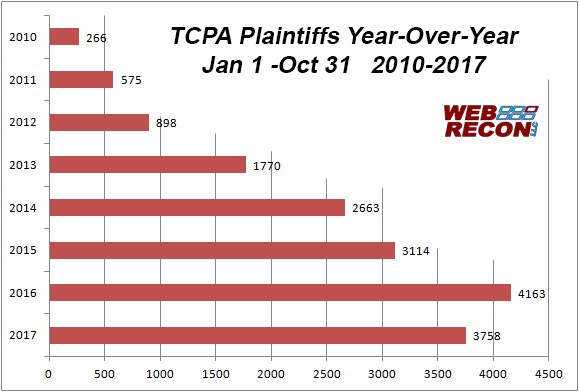 WebRecon Stats for October 2017: TCPA’s October Surprise? Beyond that, FDCPA had a rare “up” month, rising 3.3% over Sept but still down 6.8% from last year. And FCRA continues to be the star of 2017. Even though it was down by a lot (34.1%) from last month’s crazy high of 557, it is still 12.3% up over last year’s record high of 3291 for the first ten months of the year. We are still getting a handle on the flow of BBB complaints so don’t read much into the wild swings month-to-month yet. October’s 2421 complaints is a solid number, and it is likely to go up a bit when all the data is in. For reference, Jan-Sept averaged 2930 complaints each month. And finally, CFPB complaints continue their mad dash to a new record high, up 12.2% over last month and 20.5% over this time last year. Putative class actions were sky high last month with 24.4% of FDCPA and 24.1% of TCPA class action lawsuits. An insane 24% of FCRA lawsuits were filed. And finally, New York attorney Craig B. Sanders took back the crown as the most active consumer attorney this month by representing 38 consumers in October and for representing the most consumers year-to-date (449). 2421 consumers filed BBB complaints, 4010 consumers filed CFPB complaints, and about 1274 consumers filed lawsuits under consumer statutes from Oct 01, 2017 to Oct 31, 2017. Of those cases, there were about 1274 unique plaintiffs (including multiple plaintiffs in one suit). Of those plaintiffs, about 412, or (32%), had sued under consumer statutes before. Actions were filed in 165 different US District Court branches. About 749 different collection firms and creditors were sued. There were a total of 2421 BBB complaints against debt collectors and creditors from Oct 01, 2017 to Oct 31, 2017. That is down -22.2% from last month. There were 4010 complaints filed against debt collectors from Oct 01, 2017 to Oct 31, 2017. This includes 3803 (95%) timely responses to complaints, and 207 (5%) untimely responses.